RegVac is a System Registry cleaner consisting a lot of different tools to clean the registry of unneeded entries and stashes. This utility suite cleans your registry, history lists, recent lists and tips. It also removes 27 of the most common stashes and allows you to add more locations to clean. It finds keys and file lists that may be left over from long deleted files, and removes them. You can use one to add and remove programs, and it includes a System configuration utility. RegVac Registry Cleaner has 6 cleaners, 3 editors, and 7 tools that get the registry sparkling clean, speed up your computer, avoid computer crashes, and repair Windows and applications. Stronger cleaning power than other registry cleaners. Some of the tools in RegVac are not available anywhere else. Novice and Expert modes. Automation. Easy to use. Registry Backup, Pack, and Restore. Robo Vac is a bonus tool that with one click of the button cleans up to four sections: Classes, Software, Stash, and File Lists. Robo Scrubber can be set up to run on startup daily, weekly, bi-weekly, or monthly. Because your computer accesses the registry frequently, keeping it clean allows your computer to run faster and more efficiently. Sloppy programmers exist in the most popular software companies. Their sloppiness puts your computer in danger of a crash. RegVac regularly cleans out their bugs. Besides the normal dirt that RegVac and other registry cleaners clean, there are thousands of dirt piles hiding which other registry cleaners don't even attempt to get. You will find them in RegVac's Stash Vac, OpenWith Editor, and AutoComplete Editor. If you want to do a complete job at cleaning your registry, RegVac is the tool to have. When something goes wrong in the registry, it can cause Windows and/or applications to mess up. Reports are coming in from all over the world about how RegVac has fixed stubborn software problems. Complex algorithms not found in any other registry cleaner ensure that your classes are properly structured and clean. The registry is littered with history lists, recent lists, and tips. This tool removes hundreds of the most common stashes and allows you to add the location of stashes that you discover. Other registry cleaners do not clean the stashes. Many lists in the registry require special handling. This cleaner uses extra processes to discover concealed problems in the following lists: Known Drivers, Static VxD, Open GL Drivers, Shared Drivers, Start Menu, Startup, Help, Fonts, AppPaths, Extensions, HTML Help, Installed Files, Add/Remove Cache, Installer, and MUICache.. The largest part of the registry is the Software section. This cleaner searches through the Software section and finds keys that may be left over from deleted and uninstalled programs. This cleaner looks from one end of the registry to the other for references to files that do not exist on your computer. Remove all of the found entries or use the Show Key button to examine each one. Spyware and Adware love to put entries in your registry. This tool checks to see of you have any of the common ones and removes them. Checks your Add/Remove Programs list for programs that have already been deleted and allows you to uninstall programs, remove entries, and test entries. Lists the extensions that are configured through the Open With... dialog box in Windows and allows you to remove them. Every time you type something in a web form, it is saved in a secret locked part of the registry. This editor opens that area up and allows you to remove the ones you want. MSConfig is a neat little Windows utility that gives you behind-the-scenes access to your system's configuration. This tool opens msconfig for you with the click of a button and removes disabled entries in it from the registry. Even when you properly uninstall software, fragments may be left behind. This unique tool uses three methods to find the remains and remove them. Removes fragmentation and rebuilds the registry files. Goes through certain registry settings and optimizes them so that Windows runs in its optimal condition. Tells when the registry changes. Specify where to have the monitor watch in the registry. Makes full backups of the registry for your protection. Babylon 7 is the world's leading dictionary and language translation software. Babylon offers you the most intuitive tool for all your translation needs. With Babylon you can quickly translate emails, web pages, documents, instant messages, and more. All you have to do is click on the word or text that you want to translate and a small window instantly appears with the desired results from Babylon's extensive database of language dictionaries, glossaries and conversion tools. Babylon offers its users a wide range of titles from the world's premier publishing houses including Oxford University Press, Britannica, Merriam-Webster, Larousse, Vox, Langenscheidt, Pons, and Taishukan. New version Babylon six offers text translation in 17 languages in addition to single word and phrase translations - all in a single click, results from Wikipedia encyclopedia in nine languages, automatic spelling feature, and accurate results in a single-click from a wide range of authoritative sources. Babylon 7 - an easy and intuitive translation and dictionary software in over 75 languages. With Babylon 7, text translation has never been easier, no more "copy/paste" or unnecessary browser windows. Just click on any text in Word, Excel, emails, instant messaging, web pages and other desktop applications. All you need is a single click away. Babylon online dictionary is a simple and intuitive tool operated by a single click. Just click on any text written in Word, Excel, PowerPoint, emails, web pages, instant messages or any other desktop application. A small window will instantly appear containing the translation results, as well as any information or conversion that you require. You can also easily copy/paste to and from Babylon. Actually, once installed in your computer, Babylon will become a powerful and innovative reference tool of easy use that will allow you immediate online access to dictionaries and encyclopedias covering all topics and themes. Text translations in 17 languages, all in a single click. Text translation has never been easier; no need for additional browsers or copy/paste. Just click any word in the text you want to translate and Babylon will automatically identify the inserted text passage and translate it. Despite the fact, that no machine translation is 100% accurate or delivers results equal to human translation, this great new feature, based on the most advanced text translation technology, helps you understand texts in languages you are less familiar with. Babylon's text translation is available in the following languages: English, French, German, Spanish, Italian, Portuguese, Japanese, Hebrew, Chinese (Traditional), Chinese (Simplified), Dutch, Russian, Korean, Turkish, Arabic, Farsi, Polish and Ukrainian. Get single click results from the world's leading dictionaries and encyclopedias for a small additional fee. Babylon offers its users a wide range of titles from the world's premier publishing houses: Britannica, Oxford, Merriam Webster, Pons, Larousse, Langenscheidt, Taishukan, Michaelis, Van-Dale and many more. View a list of all the dictionaries and encyclopedias that Babylon offers. Babylon online dictionary's single click intuitive technology now offers its users results from Wikipedia, The Web Free Encyclopedia, a multilingual web-based encyclopedia in 13 languages covering more than 2.2 million articles and definitions that are constantly updated according to the current events and science latest innovations. The combined use of online applications such as Babylon and Wikipedia, are today imperative tools for pupils, students and professional translators. Babylon's translation and dictionary software offers results from a database of 1,300 sources in more than 75 languages. The database includes 25 professional dictionaries in 13 languages developed by Babylon's own linguistic team: English, French, German, Spanish, Italian, Portuguese, Japanese, Hebrew, Chinese (Traditional), Chinese (Simplified), Dutch, Russian, Korean and Swedish. In fact, Babylon has developed a unique instant computerized translation tool that will eventually replace your traditional printed dictionaries, offering an immediate and online access to Internet information sources and a wide range of online dictionaries and glossaries that are constantly updated. Babylon converts currencies, measurements and time-units, just click on any value in any desktop application to get instant conversions. Babylon online dictionary will automatically identify the required conversion type, based on unit symbols that appear next to the numbers. There is no more need to contact the bank or surf the web, an advanced conversion technology will allow you to find out online, at a single click, actual timetables and currency values, which are automatically updated on a daily basis. In addition to text translation, Babylon online dictionary also offers its users tools for finding the exact word they are looking for and guarantee a correct verbal conjugation. Given that many words may be translated in several ways, Babylon enables its users to see each possible translation with its equivalent translation, in the user's native language. Babylon also shows all possible conjugations, enabling thus the correct usage of the term. An automatic spelling feature available in Babylon provides solutions for common typos, misspellings and wording problems. DVD Flick is Open Source, meaning that anyone can download and view or modify the program's source code. It also means that it is absolutely free of charge. Several external programs are used by DVD Flick to do the dirty work like encoding and combining of video material. All of these programs are free, some are Open Source too. * Added: DVD menu functionality using templates. A few templates have been included already. * Added: Option for mixed format DVDs for DVD players that can play both PAL and NTSC. * Added: 23.976 FPS material now gets 2:3 pulldown performed on it when the target format is NTSC. * Added: The option to force audio channel output to mono, stereo, surround or to infer it from the source (auto). * Added: Option to always enable the first subtitle (under Playback). * Added: Detects display aspect ratio (also known as pixel aspect ratio) of many more filetypes. * Added: Option to go to the previous and next title when editing a title's properties. * Added: Option to have subtitles auto-fit into view. * Added: Subtitle lines that are too long are now chopped in two halves, otherwise they are clipped instead of just skipped. * Added: -startunattended commandline parameter which encodes a project specified with -load and quits. It only logs errors, doesn't display them. * Added: Welcome screen shown on first run. * Added: Option to override a video source's pixel aspect ratio. * Added: Option to specify burning speed. * Changed: Interface font adapts to system font setting. * Changed: Subtitle outline rendering is faster. * Changed: Better scaling\resizing\padding calculations for video. * Changed: DVD creation progress is better indicated. * Changed: Force subtitle is now named Display as default. * Changed: Slightly updated TCMPlex. * Changed: HTML tags are now stripped from subtitles (rendering them isn't supported). * Changed: SPUMux output is logged. * Changed: Improved SSA and SRT subtitle parsing. * Changed: Subtitles are now corrected for overlapping and too short durations. * Changed: When adding a title all subtitles with the same base name are added to it too. * Changed: Subtitle block dimensions are now always multiples of 2. Some DVD players only like such sizes and behave odd otherwise. * Changed: When adding multiple files they are now added in alphabetical order. * Changed: Tweaked encoding profiles. * Changed: AMR narrowband and AMR wideband audio is not supported by this version. Support may return in the near future. * Changed: Force MPEG-2 recompress option removed. 9 out of 10 MPEG-2 streams aren't fully DVD compliant anyway. * Changed: Copy MPEG-2 stream option added to force copying MPEG-2 video streams that conform to the proper image width and height. * Changed: 2nd encoding pass option removed. DVD Flick uses constant bitrate encoding thus it is useless. * Changed: Audio track sources must be equal in compression, samplerate and channel count. * Changed: Updated ImgBurn to 2.4.2.0. * Changed: When burning to disc is selected but not create ISO, no ISO image is created and a direct-to-disc burn is done. * Changed: Burner detection has been mostly rewritten. 95 - 99% of all burners should be detected now. * Changed: A title's thumbnail is now used as subtitle preview background (but still letterboxed). * Fixed: Audio delay could sometimes be detected as -1. * Fixed: Opening a project file did not work. * Fixed: Overscan border option adds top and bottom overscan bars again, now also of the proper size. * Fixed: Using MicroDVD subtitles caused incomplete encodes (up until the first subtitle). * Fixed: When running in portable mode, user profile directory is no longer created. * Fixed: Character set selection\support for subtitles. * Fixed: Creating chapters on every video source now works as expected. * Fixed: Audio delay for VBR audio in AVI files could sometimes be calculated to be in minutes. * Fixed: Bug that could cause discs that were too large to be created when an audio source was being copied (bad bitrate calculation). * Fixed: When changing the process priority during encoding it would be reset when the current operation finished. * Fixed: Crashing when an error occured. The error is now reported as it should be. * ...and many more small changes and fixes throughout. Anti-Trojan Elite™ (ATE) is a malware remover, it can detect and clean malware in disk or memory. Malware is software designed specifically to damage or disrupt a system, such as a trojan horse, a spyware or a keylogger. ATE contains a Real-Time File Firewall, it monitor system and clean malwares immediately. It is also a system security tools, you can view and control processes and TCP/IP network connections. Anti Trojan Elite provide a real-time malware firewall for user, once a trojan or keylogger would been loaded, the ATE can detect, block and then clean it in time. The ATE can detect more than 35000 trojans, worms and keyloggers currently, and the number of malware ATE could clean is growing up very quickly, we collect world-wide malwares, user can using our auto live update feature to get the power to clean these new malwares in time. • Real-time malware firewall, protecting user's computer in real-time. • Detecting and cleaning binded malware, doesn't hurt normal file and clean the malware. • Detecting and cleaning no process malware, some malware don't have a EXE file, they are only some DLL files and running as some threads in other process, ATE can detect and clean this type of malware even it's running. • Free tools. View the information of Tcp/Ip states and processes informations. • Network Manager. View the tcp/udp states and the processes they belonged to. User can disconnect any tcp connection and stop the opposite process. • Process manager. View the processes and its DLL modules' information. User can terminate any process and unload any DLL module. • Real-time registry monitor utility. Fresh Download is an easy-to-use and very fast download manager that turbo charges downloading files from the Internet, such as your favorite freeware and shareware, mp3 files, movie files, picture collections, etc. Unlike any other similar utilities, this software is 100% free, no charges, no banners (which steal your bandwidth), no spyware inside it. This tool uses four connections per file to get the highest possible download speed. Fresh Download lets you create multiple connections, pause and resume, integrates integrates seamlessly into Internet Explorer, Netscape, Mozilla, and Opera, and allows you to schedule your downloads. Finally, Fresh Download includes proxy-server support in both HTTP and FTP protocols. Has new option to add FD button on IE bar. · Turbo charges downloading files in FTP, HTTP and HTTPS protocols using your current internet connection (dial-up, cable, DSL / ADSL, satellite, T1, etc). · Pause and resume broken downloads, recovers from a dropped Internet connection. · Multiple connections download manager. To get the highest possible speed, this powerful tool uses 4 simultaneous connections (up to 8 connections) for the same file, while many other similar software only support single connection download. Based on user reports, this method may speed up your downloads by up to 400%. · Easy integration into Internet Explorer, Mozilla Firebird and Firefox, Netscape Communicator, Opera, Avant Browser, Crazy Browser, Maxthon / MyIE2, Slim Browser, in any Windows operating system (95, 98, Me, NT, 2000, and XP). Simply grabs any URL from these popular browsers and Fresh Download will take over. · Schedule your downloads for low traffic periods. · Clipboard monitoring and drag & drop features. Easily grabs any URL from any applications. · Antivirus support. Scan downloaded files from any viruses using your current antivirus software. · Ability to download from password protected sites, in both HTTP and FTP protocols. · Proxy Server support in both HTTP and FTP protocols. · Plus now it has a built-in Zip file extractor. What's new: feature to rename downloaded files. ESET NOD32 Antivirus System - Integrated, Real-Time Protection against viruses, worms, trojans, spyware, adware, phishing, and hackers. Best detection, fastest performance & smallest footprint. NOD32 Antivirus System provides well balanced, state-of-the-art protection against threats endangering your PC and enterprise systems running various platforms from Microsoft Windows, through a number of UNIX/Linux, Novell, MS DOS operating systems to Microsoft Exchange Server, Lotus Domino and other mail servers. ESET solutions are built on ESET’s one-of-a-kind ThreatSense technology. This advanced heuristics engine enables proactive detection of malware not covered by even the most frequently updated signature-based products by decoding and analyzing executable code in real time, using an emulated environment. By allowing malware to execute in a secure virtual world, ESET is able to clearly differentiate between benign files and even the most sophisticated and cleverly-disguised malware. Users of Microsoft® Windows® can experience the power and elegance of NOD32's ThreatSense Technology with ease and comfort. Our single optimized engine offers the best protection from viruses, spyware, adware, phishing attacks, and more. Keep tomorrow's threats at bay with our proactive detection technology. • Hands-on service – All ESET customers receive the same level of excellent technical support service, whether an individual computer user or an SMB. • Ease of installation – ESET Smart Security and ESET NOD32 Antivirus V3.0 scanning engines are quick and easy to install, no matter what solution is currently running. • Advanced threat protection network – ESET solutions are backed by ThreatSense.Net, a global early warning system built into the products. ThreatSense.Net extends the power of ThreatSense’s powerful analytics by automatically submitting samples of and information about new malware to ESET researchers for analysis, thus helping to close the window of vulnerability opened by new threats. • Improved system of cleaning and deleting infiltrations. The antivirus system now intelligently cleans and deletes infiltrations with no need for user interaction. performance of your computer and you will be able to work on it as usual. • The resident protection supports archive scanning. • Update optimization, smaller update package size than in version 2.7, more effective management and protection of update files against damage. • Email protection for users of Outlook Express. ESET’s new solutions are ideal for the small-to-medium size business environment. By incorporating ESET’s Remote Administrator, both ESET Smart Security and the new version of ESET NOD32 Antivirus can be deployed and managed remotely from a central location. AMD’s award-winning ATI Catalyst graphics and HD video configuration software delivers unprecedented control of performance and visual quality with ATI Radeon™ graphics processors. Certified by Microsoft® Windows® Hardware Quality Labs (WHQL), ATI Catalyst drivers for Windows Vista® and Windows® XP operating systems deliver stable performance and push the limits of innovation with advanced user-oriented features. Precision controls for power users. Tweaks for gamers and video enthusiasts. Simple wizard-assisted setup, easy multi-monitor configuration, and ultra reliable operation for working professionals. New user or seasoned expert, ATI Catalyst puts you in charge of The Ultimate Visual Experience™. o ATI Catalyst boosts graphics performance with every new monthly release, including enhancements for popular Direct3D and OpenGL game titles. o ATI Catalyst includes the ATI Catalyst Control Center™, delivering innovative features and unprecedented control of performance and visual quality with ATI Radeon graphics. o ATI Catalyst drivers for Windows Vista and Windows XP are Microsoft WHQL-certified, and include rigorously tested Linux drivers to deliver the industry’s most stable and reliable graphics performance. This release note provides information on the latest posting of AMD's industry leading software suite, Catalyst™. This particular software suite updates both the AMD Display Driver, and the Catalyst™ Control Center. This unified driver has been further enhanced to provide the highest level of power, performance, and reliability. The AMD Catalyst™ software suite is the ultimate in performance and stability. The Catalyst™ Vista driver for both the 32bit and 64bit versions of the Microsoft Windows Vista operating system is supported on the following ATI Radeon™ products. Note: ATI All-in-Wonder™ boards operate with AMD's Windows Vista ready display and capture drivers under the Windows Vista operating system. However, the Windows Vista Media Center application does not support TV/Capture functionality provided by the ATI All-in-Wonder™. TV/Capture functionality is qualified to function with Snaptream's BeyondTV 4.6 for Windows Vista. Other third party solutions (such as Arcsoft's Total Media 3) may support TV/Capture with the ATI All-in-Wonder™, but these applications have not been fully tested by AMD. Nitro PDF Professional is a high-quality, affordable PDF creation and editing application that puts the full power of PDF within everyone's reach. In addition to providing the basics — powerful, robust PDF creation at an extremely affordable price — Nitro PDF Professional includes the full range of top-shelf PDF functionality, opening up new vistas for current and new users of PDF. Nitro PDF Professional is built from the ground up as the perfect PDF product for business and enterprise, combining an extremely competitive price with a no-compromises feature set that gives users the power to organize, edit, secure and create PDF. Create, view & edit all of your PDF documents and gain full control over your PDFs with just the one application. Create PDF from Microsoft Office with one click and easily convert more than 200 file types to PDF. Copy, edit, and insert text, graphics and whole pages. Add automatic page numbering, date- and time-stamps. Add navigational aids like bookmarks and hyperlinks. For business users, Nitro lets you: markup and review documents using sticky notes, highlighting, and comments. Configure security settings, and control others' ability to print, edit, and/or copy your work. PDF is all about sharing information. You can send someone a PDF file and know they'll be able to view it correctly, no matter what kind of computer they have or what software they use. Nitro PDF Professional gives you the tools to create PDF from scratch, by converting existing files or from within any application that can print. • Easy PDF Creation. Create PDF files with a single click from within Microsoft® Office applications, by converting from any of over 200 different file types, or by using the bundled Print-to-PDF printer driver. • Create and edit compilation PDFs. Combine different files and file types into a single PDF file for convenient distribution. Add, remove and shuffle pages, or insert pages from other PDFs. • Convert to Word. Convert PDF files back to Microsoft® Word format for easier editing and copying. Nitro PDF Professional also gives you the ability to edit existing PDF files — so you don't have to go back to the original files if you want to make changes or corrections. You can also enhance your PDFs with an extensive range of interactive features. • Directly edit text and images. Use intuitive editing tools to directly insert or edit text and images in PDF files. • Stamps and watermarks. Apply stamps and watermarks to single or multiple pages - mark documents as approved, add letterheads, company logos, footers, and more. • Intelligent stamps. Add page numbers, date stamps and Bates numbers to PDF files, with control over font, positioning, and more. The built-in review and collaboration features of PDF offer an alternative to ad-hoc email or paper-based processes that is light years ahead. With PDF the entire collaboration process is electronic, so nothing gets lost and all feedback stays organized. • Intuitive tools. Add feedback in familiar and intuitive ways with sticky notes, highlighters, underlines, and more. • Nothing gets lost. Comments and feedback are attached directly to the material being commented on, so nothing gets lost. And commenting is non-destructive — the original material remains intact for later reference. • Organize feedback. Nitro PDF Professional's Comments Panel automatically keeps feedback organized, allowing you to see all commentary at a glance and to sort it by contributor, comment type, page, date submitted, and color. The built-in security features of PDF give you exceptional control over the PDF files you create: encrypt files to prevent unauthorized access, restrict sensitive operations, and more. • Encryption. Password-based PDF security encrypts the entire contents of your PDF files using the DES or AES algorithms, guarding against disclosure of sensitive information in the case of loss or theft. • Set permissions. You choose what others can and can't do with your PDF files — document viewing, printing, editing, and copying can all individually be turned on or off, or secured with a password. * Fully integrated support for PDF forms (within the main Nitro Pro application), including a number of tools to assist with layout. * Improved PDF to Word conversion functionality. * A bunch of new user preferences that allow you to control the look and feel of the application. * Enhanced support for Microsoft Office 2007 users. * Performance improvements to 'save file' and 'find' features. * Customize digital signature appearances with images of your own. With this program you can administer its Sony-Ericsson mobile phone simply. MyPhoneExplorer is a free and useful program with the help of which you can administer its Sony-Ericsson mobile phone simply. Connect your phone via cable, bluetooth or infrared and you'll be surprised how easy and efficient you can manage your phone with this compact software. Since it's first appearance MyPhoneExplorer evolved into the most popular freeware tool for SE-phones and is constantly extended by new features. MyPhoneExplorer is designed for Sony Ericsson K700, K750, K800 - but it works with every Sony Ericsson-phone except the symbian-based phones (P-series, M600, W950). VIA Hyperion drivers are suitable for any VIA chipset and all Microsoft Windows 32, 64 bit Operating Systems. Please read the information about all VIA chipset driver choices, however, so that you chose the drivers that can best be recommended for your system. VIA Hyperion 4in1 drivers are suitable for any VIA chipset - but they are particularly recommended for KT4## series, P4X4## series and newer. • Inf driver - Identifies your VIA chipset. • AGP - Provides service routines to your VGA driver and interfaces directly to hardware, providing fast graphical access - and in the case of 8X AGP cards on KT400 and P4X400 systems - provides a performance boost over previous drivers. • VIA Falcon IDE device driver package is a setup package for user to install VIA IDE controllers and it is composed of MiniIDE driver and SATAIDE driver both. MiniIDE driver is in charge of PATA controller. Oppositely SATAIDE driver manages SATA controller. Moreover, VIA SATAIDE driver provided the Hot-Plug and Port Multiplier features on VIA SATA IDE controller. Any SATA device connects to VIA SATA IDE Controllers could be automatic identified and added into the computer without reboot system. • VIA RAID Software Package is used to install the drivers and utility which are needed for using the VIA VT6410, VT6421, VT8251, VT8237/A SATA RAID controller. Version 5.17a has had the built in VIA Falcon IDE driver updated to version 2.50A. webcamXP is a powerful webcams and ip cameras management and streaming software for private and professional use. It offers unique features and unequaled ease of use to let you broadcast and manage multiple video sources on the same computer. It is the perfect tool to secure your goods and to easily manage users' accesses. This is our brand new webcamXP 5 project. It has a simpler interface, provides better performances, includes additional features and is now replacing webcamXP 2008 which was quite heavy for most systems. webcamXP 5 has been specially designed for Vista and it also works on Windows XP, 2003 and 2008 Server. webcamXP Free is the basic product for home-users. It lets you to stream via HTTP, Windows Media or to upload via FTP/FTPS or HTTP/HTTPS Post. It also lets you add overlays / watermarks over your video streams and the basic features such as capturing or recording at fixed interval. This version is ideal for putting live webcam on your web page and is robust for 24/7 broadcasting. Supports a single video source. webcamXP Private is already more advanced and beside the multiple video sources support is also offers the possibility to filter by IP and to manage who can access your video streams smartly. You can limit users in view time and don't have to worry about your privacy. Supports up to 5 video sources. webcamXP PRO is the most advanced version of the software. It has all the features of the Private version and supports and includes the motion detector (optical and/or acoustic detectors), the advanced alerts manager, the ability to log traffic to files and the digital video recorder (permanent recording). It's the perfect solution for advanced security purposes at low cost. Supports unlimited number of video sources. - run as service new ! - local and remote pan & tilt control (Logitech Orbit, Creative LiveMotion! and IP cameras). - advanced users manager to grant limited or unlimited access. - overlay editor supporting picture in picture, animated gifs, alpha-blending and text editor. DriversMicrosoft DirectX is a group of technologies designed to make Windows-based computers an ideal platform for running and displaying applications rich in multimedia elements such as full-color graphics, video, 3D animation, and rich audio. DirectX includes security and performance updates, along with many new features across all technologies, which can be accessed by applications using the DirectX APIs. At the core of DirectX are its application programming interfaces, or APIs. The APIs act as a kind of bridge for the hardware and the software to "talk" to each other. The DirectX APIs give multimedia applications access to the advanced features of high-performance hardware such as three-dimensional (3-D) graphics acceleration chips and sound cards. They control low-level functions, including two-dimensional (2-D) graphics acceleration; support for input devices such as joysticks, keyboards, and mice; and control of sound mixing and sound output. Because of DirectX, what you experience with your computer is better 3-D graphics and immersive music and audio effects. - The DirectX redist installation includes all the latest and previous released DirectX runtime. This includes the bi-monthly D3DX, XInput, and Managed DirectX components. - The DirectX runtime cannot be uninstalled. We recommend Windows Me and Windows XP users create a "System Restore" point before installing. Simply put, DirectX is a Windows technology that enables higher performance in graphics and sound when you’re playing games or watching video on your PC. Prevent data loss quickly and easily! With O&O DiskImage, you have a high performance tool at your disposal for making professional images of entire computers or drives. After imaging, your old data is quickly available when problems with your computer arise. Simply recall the image and your computer is back as it was before! O&O DiskImage can perform either an incremental imaging or just as easily image an entire system. The imaged data can then be encrypted and also compressed to various different levels. The splitting of images onto different storage volumes can either be individually set or O&O DiskImage will automate the splitting. Should only particular files or directories from an image be required, it is not necessary to restore the whole image. Images can be mounted as drives with O&O DiskImage enabling direct access to individual files or directories. Professional Backup of Your Data! A string of successful software products in the hard disk arena form the basis of O&O DiskImage. As millions of our happy customers worldwide will testify, O&O has over the years gained considerable expertise in moving files during defragmentation. By using this experience, O&O has now developed a product that enables you to image and restore your entire hard disk. O&O DiskImage supports all important functions and combines this with a user friendly interface for the quick and simple imaging or restoration of data. O&O DiskImage offers two alternatives to choose from when imaging data: a complete image or an incremental image. The complete image provides yet more flexibility with the offer of either a forensic image of the storage medium or an image of the used sectors only. With every image, including incremental images or split images, every piece of information in every image file is saved. This avoids a situation where images may be missed, whilst also maintaining a structural consistency throughout. O&O DiskImage supports compression and encryption in accordance with AES (128, 196 and 256-bit). Encryption can be configured individually for every image, including incremental images. The readout of information (though not the image files) is also possible where a password is unavailable. Complete and incremental images can be mounted as drives through O&O DiskImage and Windows Explorer and also then unmounted again. This enables direct access to individual files or directories without the need to restore the whole image content. Images can be split into either traditional portions (CD, DVD etc.) or also on user-defined scales. An automatic split is also possible, when for example the target drive is full or the maximum file size for the file system has been reached. Compression and encryption for every image can be individually selected too. 64-bit and Multiprocessor Support The creation or restoration of an image is significantly accelerated by the native support of 64-bit and multiprocessor systems. O&O DiskImage supports Windows XP 64-bit. For restoring an entire system there is no need for a rescue CD to be created as a Start CD is provided (the so-called “bare metal” technology). The CD is based on Windows Server 2003 (PE) and contains all the standard Windows drivers so that, on most systems, a complex integration of drivers is not necessary. The option to install additional hard disk control drivers is however still available. Once the Start CD boots up the PC, O&O DiskImage enables the required image to be selected and then fully restored. BackUp & RecoveryFileRescue Pro is an easy to use, but powerful software utility designed to restore accidentally deleted files and folders. It allows you to recover files that have been removed from the Recycle Bin, as well as those deleted by-passing the Recycle Bin (e.g. Shift-Delete). It will also recover files deleted by virus or Trojan attacks, unexpected system shutdown and software faults. 100% FREE to try. FileRescue Pro works under Windows and supports the FAT12, FAT16, FAT32, NTFS and NTFS 5 file systems, even if such partitions are formatted, changed, damaged or deleted. SmartDraw - The World's Most Popular Business Graphics Software. Create professional-looking business graphics in minutes. No experience needed! SmartDraw's point-and-click drawing method makes it easy for anyone familiar with basic computer tasks to easily create professional-quality business graphics. Compatible with Windows XP, 2000 and Vista. Create professional flowcharts, floor plans, org charts, technical diagrams, or calendars using our easy to use SmartTemplates. Plus, SmartDraw works hand in hand with Word, PowerPoint, Excel, and other tools. SmartDraw 2007 features dramatically improved graphics capability, with professionally designed gradients, textures, effects, styles, and themes. New SmartTemplates make you an instant expert in drawing 33 of the most-needed charts and diagrams, even if you've never seen one before Work Smarter. An all-new user interface puts your most used tools and features just one click away, and automated functions do the hard work for you. Better Graphics with all-new special effects--see all the enhanced graphic capability built into SmartDraw 2007. Faster Results, thanks to SmartTemplates that almost automatically create correct flowcharts, Gantt charts, software design diagrams, electrical engineering diagrams, ecomaps, genograms, floor plans. 1. PICK a template. There are over 150 professionally designed SmartTemplates™, so it's easy to look like an expert! 2. DRAG shapes, lines, and symbols to where you need them. Choose from a library of over 20,000 standard symbols and shapes. PowerArchiver offers hundreds of features, yet remains easy to use, small and fast. Novice users will find a familiar interface complete with tutorial and detailed help, while more experienced users can take advantage of full Explorer integration, multiple encryption methods and advanced compression algorithms. PowerArchiver is an award-winning archive utility for the Windows® family that provides support for most compressed and encoded files, as well as access to many powerful features and tools through an easy to use interface that seamlessly integrates with Windows Explorer. PowerArchiver creates and works with unlimited size ZIP archives with enhanced ZIP format speed and compression; a Password Manager stores your frequently used passwords; encrypts your archives using 5 different methods including 256-bit AES; back up your work with PowerArchiver's Auto-Backup tool and FTP support; creates powerful CAB and ZIP self extracting (SFX) archives using a Wizard; a Batch ZIP tool compresses hundreds of files all at once; and a Multi-Extract tool can extract hundreds of archives instantly. * Preview window - easily preview archives, images, text and many other file types, without having to open archive or file. Works both while browsing drives and inside archives. Supports Plug-ins. * Backup list window - see your backups on integrated list for easier usage. * Speed - overall great speed improvements in compression and extraction, especially in Vista with RAR/ZIP files. * New ZIP Engine - zip can now compress files in use; proper progress window. * Improved 7-Zip Engine - support for fast updating of non-solid archives, themed overwrite dialogue with proper options. * Unicode support - better support for Unicode in 7-zip and RAR formats. * New Configuration window - easier to use configuration window. * Modern/Classic interfaces - streamlined for easier use, more MRU's. * Archive Convertor - added "save password for current session" option. * Encrypt Tool - completely redone - now option to create zip and 7zip encrypted archives, as well as encrypt current archives to 3 different formats (zip, 7-zip, pae). * Batch Archive tool - added "Add subfolders to separate archives" option. * Multi Extract tool - added "File's current folder" and "Save password for current session" options. * Add window - redone for easier usage and more options added. * Transparent Updating - added support for updating solid cab archives. * Web Update - now checks for PAOP updates as well as any other PA component. * Installer - future updates can now come in form of patches. * 64bit skinning engine for x64 systems. * Interface - completely new interface with sidebar navigation. * File list support - export/import file lists. * Filters - added include and exclude filters at the same time. * Backup Types - added full/incremental/differential backup types. * Unicode - completely rewritten for Unicode support. * Reorganized - more features, more options, less clutter. * Many improvements and bug fixes. * CD/DVD/Blu-Ray burner (PRO) - burn archives, images and any files directly from PowerArchiver or shell extensions. * Create ISO (PRO) - create ISO files in PowerArchiver, either by ripping the CD/DVD/BD or directly from disk. * Virtual DVD (PRO) - mount ISO files in Virtual DVD. * FTP Client (PRO) - download and upload files directly from PowerArchiver via FTP. * 7-zip compression (PRO) - added 7-zip compression option to Backup. * Burn to CD/DVD/Blu-Ray (PRO) - added burner option to Backup. * Scheduling - create/edit Windows Schedules from within backup and PowerArchiver. * Logs (PRO) - added logging capability with email support. Titan FTP Server is an enterprise class server product for storing and sharing files. Titan provides an advanced feature set, giving you flexibility and control. An intuitive user interface makes Titan FTP Server easy to set up and maintain. For Large Enterprises: Titan offers unlimited user accounts (professional edition) and the controls to appropriately manage them. Bandwidth throttling and configurable maximum transfer speed allows you to customize the bandwidth given to any user or server. You can regulate the number of connections from a given IP, and block users and IP's after a configurable number of invalid commands. The control and scalability that Titan FTP server provides offers an excellent file sharing solution for even the largest enterprises. Advanced features include: SSL support for secure file transfers, Virtual Folders, Unlimited user accounts (professional edition), Bandwidth Throttling Support, S/KEY Password Encryption, UL/DL Ratios, Disk Quotas, Banned/Free Files Lists, Anonymous Access Enable/Disable, Custom Messages, Log File Rotation. Security and Access Control: Titan provides security and access control features such as SSL for secure file transfers, S/Key MD4 and MD5 password encryption, enabling or disabling of anonymous access, and the ability to permit or deny access based on IP address. The server also includes the ability to block FXP and PASV mode transfers. For Home Users: All of the advanced functionality of the Enterprise version is included in a less expensive home version. And with features like configurable upload/download ratios and disk quotas, you can control the way that files are shared on your system. - Titan must be installed under an account that has full Administrative privileges to the PC on which Titan is being installed. - To uninstall Titan FTP Server, select add/remove programs from the control panel and select Titan FTP Server. You can also select the uninstall icon in the Titan FTP Server Program Folder to uninstall Titan FTP Server. - If you plan to use Titan in conjunction with User Accounts on an existing NT Domain or Active Directory, please review the associated whitepaper (PDF) found on our website. * Added: Support for the DMZedge Server Keep-Alive feature. * Added: FTP option to force NLST to return directory names in addition to returning file names. * Added: SFTP and FTP option to 'lock file during upload' which will force Titan to create an exclusive lock on the server file while it is being uploaded from the client. * Fixed: User home directories were not being created correctly if the user inherited their home directory from the group level and the 'create home directory' option was enabled in the New User Wizard. * Fixed: A/D authentication issue which failed to honor the User Category filter. * Fixed: Issue which prevented users from logging in if Titan was running a cluster and SQL Server was used as the database engine and Active Directory was used as the authentication engine. * Fixed: Issue which could prevent Titan from reconnecting to the DMZedge Server if the connection was forcefully closed by a firewall. * Fixed: File/Directory conditions were not firing correctly if SQL Server was used as the database engine. 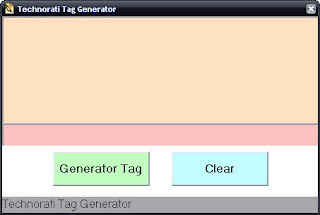 Technorati Tag Generator is a tool helps to build Technorati Tag keep use for a person does Blog or Website The all. Work instruction easily just add the word will that want to do Tag already separate each the word with the symbol ( , ) from that time press Gen as a result will get the code for add Blog already. - The most advanced registry cleaner to clean windows registry. - Clean unneeded junk, temp and obsolete files from your disks using disk cleaner. - Clean browser and application history, cache, temp files, cookies etc. - Control the applications that start automatically with Windows, using startup organizer. - Fix broken start menu and desktop shortcuts. - Remove true duplicate files. - Two modes - expert and normal. - User friendly, stable and safe. - Optimize, speed up and cleanup your system. - Protect your privacy and security. - Block spyware, trojans, adware,etc. - Fix certain application errors. - No need to spend too much time, do it ultra fast. - Understand your computer better. - Maintain your system like new. eMule is a popular, open source P2P (peer-to-peer) file sharing client for Microsoft Windows, based on the eDonkey2000 protocol. Started in May 2002 as an alternative to eDonkey2000, eMule now connects to both the eDonkey network and the Kad network. The distinguishing features of eMule are the direct exchange of sources between client nodes, fast recovery of corrupted downloads, and the use of a credit system to reward frequent uploaders. Furthermore, eMule transmits data in zlib-compressed form to save bandwidth. eMule is coded in Microsoft Visual C++ using the Microsoft Foundation Classes. As of July 2002 eMule has been free software, released under the GNU General Public License; its popularity has led to eMule's codebase being used as the basis of a Linux-specific client, xMule, and a multiplatform client, aMule, along with the release of many eMule mods (modifications of the original eMule) on the Internet. eMule is one of the biggest and most reliable P2P file sharing clients around the world. Many developers contribute to the project, so the network gets more and more efficient with every new version. • eMule's Queue and Credit system helps to ensure that everyone will get the file he wants by promoting those that upload back to the network. • eMule is completely free. eMule is also completely free of any Adware, Spyware, and ect. We do this for fun and knowledge, not for money. • Each file checked for corruptions while downloading to ensure an error free file. • The eMules Intelligent Corruption Control helps to speed up the correction of corrupted parts. • Auto priorities and Source management allows you to start many downloads without having to monitor them. • The Preview function allows you to look at your Videos and Archives before they are completed. For video previewing, we recommend the Video Lan Client. • The eMule features webservices and a webserver that allows you to have quick access to and from the internet. • You can create categories for your download to organize them. • To find the file you want, eMule offers a wide range of search possibilities which include: Servers (Local, and Global), web based (Jigle, and Filedonkey), and Kad (Still in Alpha). • eMule also allows you to use very complex Boolean searches that make the searches much more flexible. • With the messaging and friend system, you can send messages to other Clients and add them as friends. In your friend list, you can always see if a friend is online. • With the build in IRC client, you can chat with other downloaders and chatters around the globe. - Added deleting of single entries from AutoComplete drop down lists by pressing the DEL key. - Added a new search method option "Automatic" which lets eMule choose which search method to use. eMule will select either Servers (Local) or Kad, based on which network we are connected to and some other indicators if connected to both networks. - Removed a general exception handler for the Beta version. This means eMule crashes instead of ignoring unexpected errors, which however is needed so we actually can find such bugs (if any exist) in the crashdumps. - Fixed: Shared Files window splitter did not properly save/restore position. - Did first small step in dropping Kad1 support by not probing unknown Kad contacts for Kad1 anymore to save overhead. Kad1 clients will nevertheless still be work for now. - Fixed: Memory leak in context menus. - Added: Vista styles for context menus. - Fixed: Pressing ESC in Shared Files window filter destroyed the entire window. - Fixed 100% CPU usage bug with tooltips in Statistics Graphs. - Added: Tooltip in Statistics Graphs show the Y-value. - Added: Unshare context menu entries for directories within the virtual "Shared Directories" folder. - Added: Vista themes for all owner drawn tab controls. - Added: Vista themes for category selector controls. - Fixed main toolbar redrawing problems under Vista. - Added new close icons for closeable tab controls. - Fixed: Tab controls were not sized correctly on certain text contents. - Fixed: Category tabs in Transfers window did not show correct default text color. - Fixed: Category properties dialog did not always show the correct (default) category color. - Added: Hot tracking effects for Vista themes for all (owner drawn) tab controls. - Fixed: Tooltips did not show correctly with Vista Aero theme.